Qom (Persian: قم) is a holy city between Tehran and Isfahan. Qom is 120 km from Tehran. Qom is one of the holiest cities in Iran and the Middle East, and has a very long history. A famous site is the Fatima È Massummeh Shrine, which is a highly respected shrine and a very clean place. People of different nationalities are allowed to enter the shrine, no matter what their religions are or where they come from. Qom has for a long time been the main city for religious studies in Iran. Hozeye-Elmiye-Qom is the largest theology school in Iran. Many senior clerics of Shia Islam live in Qom. The nearest and most easily accessible international airport is Tehran's 1 Imam Khomeini International Airport (IKA IATA), which is due to replace the older 2 Mehrabad International Airport (THR IATA). The city's own airport 3 Qom International Airport (OIIQ IATA) is under construction, and is expected to be completed by the end of 2019 (Nov 2018). Qom is well-connected by train, there are several daily trains from the capital Tehran, slower regional trains take about 2½ hours while the high-speed trains make the journey in just 1½ hour. There are high-speed connections from Arak and Yazd as well. Overnight trains runs from Isfahan, Mashhad and several other cities. Notice that there are two stations, the central 4 Qom railway station (☎ +98 2516617141) where regional trains stop and 5 Mohammadiye railway station about 10 km outside the side. High-speed and intercity trains only stop at the latter one. There is a pretty impressive bus and taxi system, which has many bus routes to Tehran and other cities. It is very cheap to travel by local buses in Qom. Local buses cost 7,000 rial, from any where to any point on the bus' route. You can travel almost anywhere by bus from mutahhari square( 'the square'). Private tour buses are generally much more expensive. Also almost all main roads have circular taxi routes to M. Amin Blvd or the Holy Shrine. 1 Jamkarân Mosque. The mosque is reserved for Muslims only. 2 Mar'ashi Najafi Library (The Great Ayat Allah Marashi Najafi), ☎ +98 25 3774 1970. Considered the third largest Islamic library with over 500,000 handwritten texts. 3 Shrine of Fatima-al-Massumeh. The Holy Shrine is the burial place of "Fatema È Massumeh". Also buried within the shrine are three daughters of ninth, Twelver Shī‘ah Imām, Muhammad at-Taqī. Women must wear a chador to enter. Howzeh lake. Rich in natural spring water which is said to purify the heart. 4 Feyze seminary. A place where devout Muslims gather to meet and hear speeches from the religious leaders. 5 Religion University (University of Religions and Denominations) (Shahrak Pardisan), ☎ +98 25 3280 2610. Qom Handicraft Museum (Handicrafts And Traditional Arts Museum Of Qom), 19 Dey(Baajak) street, Alley #11, Number 15, ☎ +98 25 377 404 92. 08:00-14:00. This magnificent museum is located at Yazdan Panah House belonging to the late Qajar and early Pahlav (with back nearly 120 years). Qom has many carpet and sweet shops. Qom is famous for it's "sohân" (Persian: سوهان‎), a flat sweet biscuit made of pistachios and saffron. "Gaz" (Persian: گز‎), a nougat sweet is also available. Qom is also known for its unique and beautiful silk rugs. As one of Islam's holy cities, there are numerous religious shops which sell religious books, versions of the Koran and compact discs. There are lots of places to eat in Qom which range from old-style Persian restaurants to international restaurants. Persian restaurants offer a more authentic cultural atmosphere than international restaurants. Most of the restaurants with good quality of food and environmental conditions are in Mohamad Amin Blv. which is recognizable by its tall compact trees. Places include Alborz, Madain, Morvârid, Jam and Markazi. You can find kabâb, grilled chicken and fried fish there. Dizi Baar (serving âbgusht) and Lebanese restaurants are located on Al-Qadir Boulevard and Mohamad Amin Boulevard. In Qom, there are various cafes and fruit juice shops. Pomegranate juice is popular and is said to heal the sick. In the winter when it snows, hot chocolate and Persian tea (châi) are available. 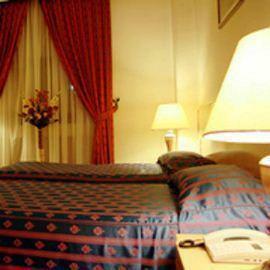 1 Qom International Hotel, Helal Ahmar Street (Motahary SQ). Qom International Hotel is a four-star hotel and is one of Qom's more well-known hotels. It is next to the shrine complex. It features a decent restaurant inside and a kebab eatery outside its premises. Internet only in the lobby. expect 2.5 million rials for double occupancy. Discounts available outside the main season..
Kawsar Hotel. In the same alley as the Negin hotel is the Kawsar, a two-star which is fine for 1 or 2 nights. Hefty bargaining possible among the neighbouring hotels. Decent rooms, with hot shower. Toilet on the hallway. Cost 900,000-1,900,000 rials; haggling can get the lower price. Khorshid Hotel, Sadr Boulevard (Motahary SQ). Khorshid Hotel is in front of Holy Shrine. Qom is one of the holiest cities in Iran and the Middle East, and as such be aware that Islamic customs and values are more likely to be important here than elsewhere in Iran. Don't let this worry you at all: ensure that you are respectful of religious and cultural practices and that you are dressed appropriately and modestly. Tehran – 120 km from Qom. Capital and largest city of Iran. Yazd – 500 km from Qom. If you feel like visiting another quintessential Persian city, you can visit Yazd, a beautiful ancient one. Isfahan – 300 km from Qom. Another option and a very beautiful city, considered to be one of the oldest and most historic cities in the world. Na’in – 300 km from Qom. It's a small and quiet town at the edge of the desert to the south. You can cycle around and visit inside the Qanat or the underground man-made caves. To get there, ask for the bus to Yazd, Kerman or Zahedan and ask the driver to get you off at Na'in.